I decided it was time to purchase some drops and there are some amazing companies out there that are just out of reach for me. I happened on Gravity Backdrops and they seemed affordable and in the style I like. So I bought a few and here was my experience. I searched on Gravity’s site for readymade drops to purchase and was instructed to go to their Facebook page. The first thing I noticed was there was no way to just buy backdrops directly on their site. A lot of these services are custom so that wasn’t a big surprise but I wanted to just pick from a lineup and purchase. In the Photos section of Gravity’s Facebook page you’ll find galleries of ready-to-purchase backdrops. On their Facebook page you can see they actually do have readymade stock in various sizes. There still wasn’t an obvious way to purchase these but anyone who asked on their page were simply told to message Gravity on Facebook. Call me inexperienced but this is actually the first time I’ve ever made a purchase through Facebook. This is a really weird way to order things, in my opinion. My spider sense was going haywire, “Is this a scam?” I figured that if it was I could summon the dark forces of the entire photography empire against them so I stopped worrying and dove in. They may or may not offer you some kind of deal if you order more than one. The awkward exchange went back and forth like this for awhile (I suppose before the internet people would merely have awkward exchanges on the phone instead). It all concluded in them invoicing me, me paying them via PayPal, and them (eventually) sending me my tracking number (it took about 3-4 days because they had to clear customs first – seemed reasonable). I chose 1143 brown, 1192 green-gray, and 643 blue. I still half felt like these backdrops would never arrive – or they’d arrive damaged and months later. But it actually only took about a week! Note that I might just be lucky here because these ship from Europe and customs doesn’t keep a strict schedule. Your results may vary. My backdrops arrived in a hard plastic (not cardboard) tube. The ends were protected by a layer of plastic followed by a layer of canvas and then another layer of plastic. Outside the shipping tube. The drops came rolled up all together inside a layer of plastic wrap. The ends were not perfect. They suffered some damage during transit. If you’re not opening your backdrop package right away, remember to store it horizontally and not vertically (good advice for any backdrop storage). The backdrops come all rolled together – they are not separated by anything. That didn’t seem to be a problem to me – I just figured it was worth mentioning. Backdrop color written on the back. Green-gray drop all rolled out. It looks a bit brown here but these drops are very chameleon-like – lighting really changes how they look, which can make ordering difficult since you’re at the mercy of what their snapshots display (probably true of most online backdrop ordering). There were some imperfections on the drops – like this area where paint was chipped away. There was some creasing on the outer edge of my blue drop. My brown drop did not lay perfectly smooth – you can see some bubbling in the center (this faded after hanging it up for awhile but initially I was annoyed). My blue and green-gray drops. Brown backdrop hung up. I ordered the “mid size” which is 6.2’x9.2′. Good for 1 subject – 2 if they are cozy. I am used to working with less so this size is an upgrade for me. Seeing snapshots of these backdrops is valuable but even better is seeing how they render in actual portraits. I was commissioned by a couple for a shoot with their dog and I was excited to use these new drops on them. Test shot of myself against the drops – I was already pretty pleased with the results. 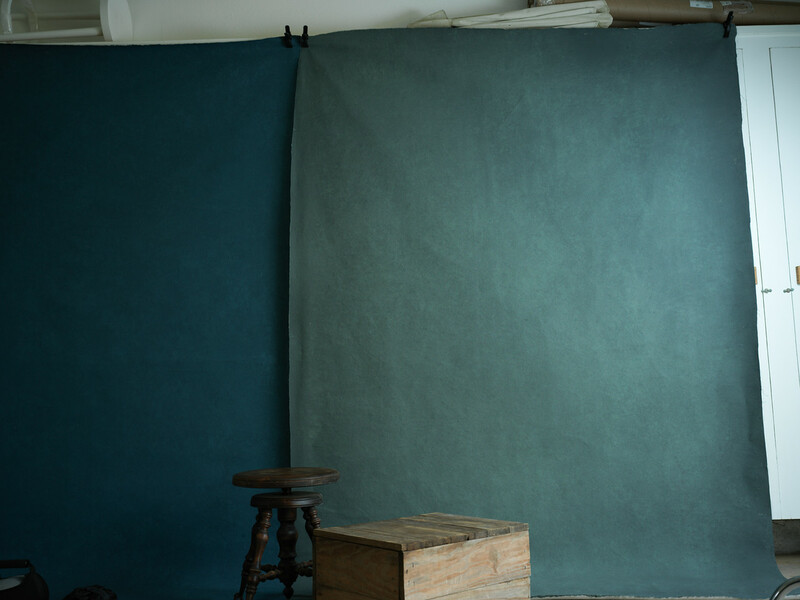 Two mid-size Gravity Backdrops side-by-side (1192 green-gray and 643 blue). I like my green-gray and blue the most as-is but I found the brown to be the most versatile. It provided a lot of latitude with color changes in post production. I’d imagine that a straight gray backdrop (textured) would be the most versatile if you are forced to only purchase 1 color. I am looking forward to doing more shoots with these. They are much more affordable than their competitors but still not “cheap” by any stretch. I will likely continue to hand-paint my own backdrops when a unique color is needed and use my Gravity Backdrops as my standard set for most shoots. If you have any other questions about my Gravity experience, I’ll do my best to answer but feel free to reach out to them on Facebook for details on pricing, shipping, and other logistics – they have a pretty good response time. Special thanks goes out to my models, Caitlin and Chris, as well as their dog, David Bowie. Thanks for reading! Enjoy a limited-time discount on Photoshop classes through CreativeLive, one of my favorite companies in the industry. Thank you Alexandria, I’m glad I stumbled upon your post because I had the same concerns ! Great review. I went on their site and I was like, Ok where do I order. The contact through FB was awkward but I guess it works. I’m not sure why they don’t just do it thru their site. Odd. Thanks so much for the review! Are you still happy with your color selections? I’m thinking of getting two Larger and one free standard — would the “Larger” sizes suffice for a two person shoot or a single person who may pose in ways other than simply a standard standing or sitting pose? I got the mid size but I kind of “cheat” and layer the backdrops to make 1 larger one (https://photos.smugmug.com/photos/i-sVcskxB/0/d288de85/X2/i-sVcskxB-X2.jpg) – and that only works if you like that messy two-tone backdrop look. As you can see in some of the examples above, I was able to squeeze 2 people (and a dog!) into the frame with the mid size…but it’s tight. The standard would definitely be your “headshot only” drop while your other two larger ones would be good for couples. Likewise, I came across their product through a youtube video – but when I went to look at pricing, it was bewildering at best. Weird way to do business. Standard: 1.6m×2.5m (5.2ft×8.2ft) – €300 ($320). Mid: 1.9m×2.8m (6.2ft×9.2ft) – €350 ($380). Larger: 2.1m×2.8m (6.9ft×9.2ft) – €400 ($430). XLarge *New Size*: 2.8mx4m (9.2ftx13ft) – €800 ($850). Do you know where they are located or where the backdrops were shipped from? I can’t find any phone or address for them. They are from Serbi, I believe. It is an odd process, especially if one doesn’t have Facebook like me, but so worth it. I bought three after great from Alexandria and the people at Gravity. Very good comments ! Thanks a lot . It helped !!!!!!! thanks for your helpful post. Are the Backdrops “low texture” backdrops? Thanks fro your answer. No, I would consider these fairly high texture. Not the most extreme I’ve seen, certainly. With the right light positioning, you can make them appear flat. But it would take some effort.